My niece attended graduate school just outside Boston, and had a flat-mate who eventually ended up doing development work in Cambodia, Laos and is now stationed in Tacloban with a multinational agency. We invited her flat-mate to dinner at home to welcome him to the country, thank him for all that he is doing on behalf of those affected by Typhoon Yolanda, and to make sure he had a hearty home-cooked meal after many weeks out in the field. I asked him if there was anything special we could cook (perhaps a favorite from home, a particular dish, etc.) and he said he was vegetarian, but also occasionally ate fish. This is the mostly vegetarian meal we put out that evening… For starters, we made bowls of baba ghanoush (roasted eggplant dip) and hummus (chickpea dip) and served that with warmed pita triangles. We also had a bowl of dry roasted and salted pistachios. For the main meal, we put out a buffet of dishes, hoping he would find something he might like. 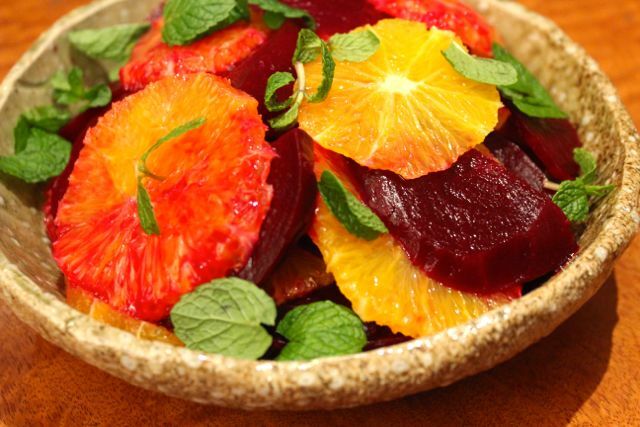 Up top, a simple salad of marinated beets with orange slices and garnished with mint. 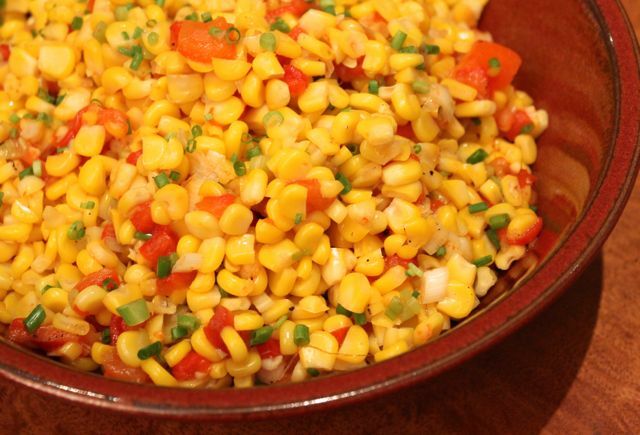 A second dish was made of fresh corn, red peppers with a sweet tangy dressing. A cold lentil salad with slow-roasted tomatoes and chunks of gorgonzola in one platter was put beside a platter of casareccia pasta with fried zucchini, herbs, mozzarella, etc. 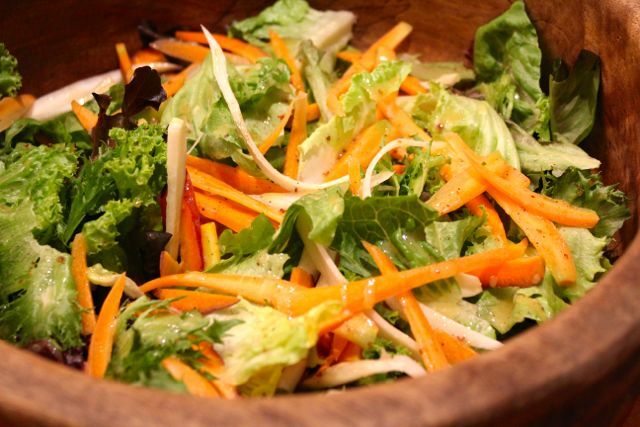 …and I leafy green salad with multi-colored carrots. 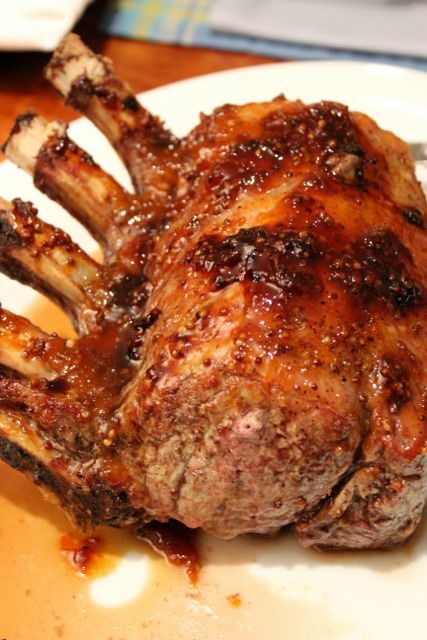 We also had non-vegetarian guests, so we put out a small veal rib roast with an apricot jam, whole-grain mustard and grand marnier glaze. 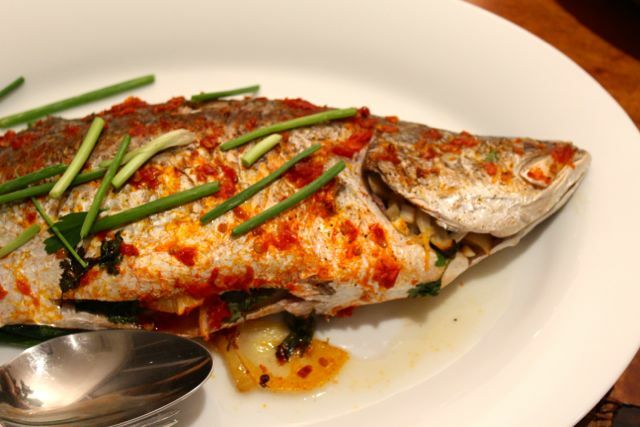 A baked apahap or sea bass with lemons and sambal was also on the menu. For dessert? A home-baked apple pie, with some vanilla ice cream, guests brought a turtle pie and some leche flan. I think our guest from the U.S. via Tacloban was fed-up. Literally. Hahaha. It’s really nice to think through a vegetarian meal. I love vegetables but rarely put out a mostly vegetarian spread. I really should do that more often. What a colorful spread and I am sure so delicious. Sa kulay pa lang busog na! Bless your heart always for being so hospitable. Lucky guests. Finally! A feast for the eyes and belly of vegetarians like me! Your spread is both gorgeous and delicious! I will have a grand time had I been one of your guests :-) Will copy this spead on my next cooking day :-) Thank you for this post, I love it! I’m not a vegetarian but I eat more veggies than meat. Everything looks fresh and delicious. 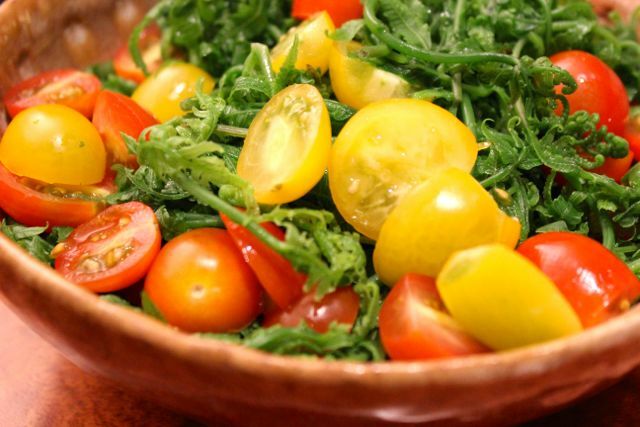 For non-vegetarians a splash of bagoong on the palo greens with tomatoes would be yummy. We cook spicy ginataang pako when leaves are aplenty at the market. the fish and the veal really made me hungry….very nice colors on the salads! This looks awesome and mighty yummy! While I am not vegetarian, I do love my produce – the pako looks FAB! Ha, ha, I knew your vegetarian guest would have been ”fed up”. He must have been overwhelmed by the variety you served. 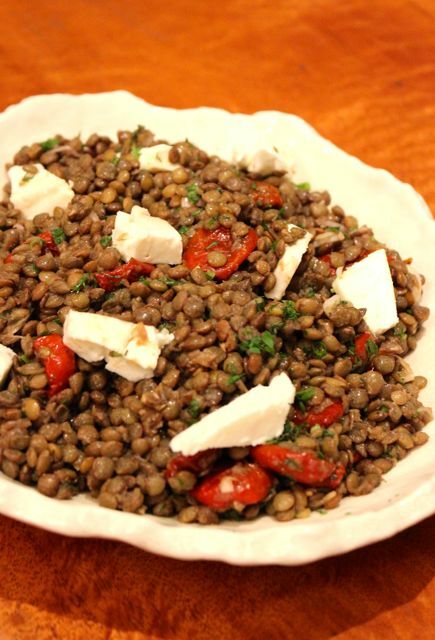 Do you have a recipe for the lentil salad? The du puy lentils she recommends are a bit expensive (I’ve only seen them in Santis), but I’ve tried it with green lentils on the al dente side. Fabulous. what a splendid meal, MM! great photography, too. love all the colours…and the flavours must have been lovely! thank you for sharing.